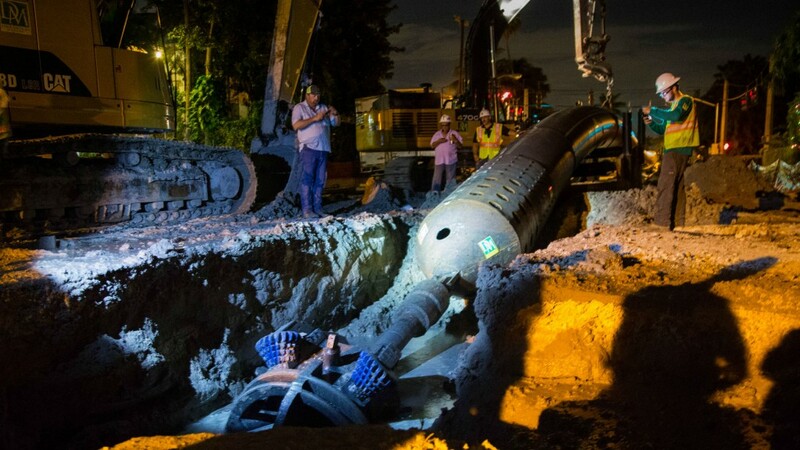 "Not only was this a very long pull," stated Tony Radoszewski, CAE, president of PPI, "but the diameter of the pipe was also a challenge in replacing the existing sanitary sewer line in Miami Beach. More than 4,200 feet of 54-inch diameter HDPE (PE4710) pipe was used. This was quite an accomplishment and we were pleased to present the Project of the Year Award to ISCO." Failure of this force main, which is the only means of wastewater conveyance for the city's nearly 92,000 residents, would be disastrous. It could potentially discharge millions of gallons of raw sewage along the urbanized corridor of one of the most popular tourist destinations in the world. This would impact residents and commercial operations, threatening contamination of pristine, ecologically-sensitive waterways, beaches and parks in this scenic area. The economic impact of forced closures of hotels, restaurants, and tourist attractions and businesses would devastate the city. The existing 54-inch pre-stressed concrete cylinder pipe (PCCP) sanitary sewage force main (FM) was constructed in 1977 and served as the sole means of wastewater conveyance through Miami Beach. By 2012 it was deteriorating like much of the infrastructure in coastal communities. Faced with the potential threat of failure, the city embarked on a Capital Improvements Program, totaling $750 million during five years. In 2013, the city invested in a non-destructive condition assessment. Using Pure Technologies' PipeDiver, the PCCP FM pipe was analyzed and it was determined that the line was on the verge of catastrophic failure. A 54-inch IPS DR-17 HDPE pipe was chosen with technical assistance, pipe fittings and fusion services provided by ISCO. ISCO's technical expertise and support helped maximize the construction efficiency and minimize the social impact. HDPE pipe material was chosen for this project not only because of its low life cycle cost and monolithic features, but also because of its lightweight and ductile properties which makes it the ideal material for the HDD construction method. The pipe fusion on the project was done with one of ISCO's McElroy MegaMc 2065 fusion machines operated by one of its certified technicians. The highlight of the fusion operation was joining two strings (3,000 ft and 1,200 ft) of pipe during the pullback process. Use of HDPE pipe made HDD feasible, saving time and money on the project for the city, and allowing areas of a busy residential/tourist area to remain open during the construction of the line. "HDPE pipe is the tested and proven solution for force main rehabilitation and trenchless construction," stated Camille George Rubeiz, P.E., F. ASCE, senior director of engineering for the Municipal and Industrial Division of PPI. "The strength and flexibility of PE4710 made it ideal for this longest and largest HDPE pull, which is literally groundbreaking and proves the material's capabilities. The time and money it would have taken to dig up and replace the existing line would have made this project unrealistic. The disruption to the city, its residents and visitors, would've been enormous especially since it was done during the busiest season for tourism. Instead, a dedicated team of HDPE pipe supplier and manufacturer (ISCO industries and DuraLine), engineers (Brierley, Associates, AECOM and others) and contractors (David Mancini & Sons, Spartan) pulled together to pool their experience and come up with a creative, innovative, and cost-effective solution to provide the City of Miami Beach with a reliable force main that will last for decades. It showcased the ability of HDPE to save money, time and provide innovative solutions for the City of Miami Beach and is truly worthy of the PPI Project of the Year Award for the Municipal and Industrial Division."